The existing design for AOPS (dating back to 2009). 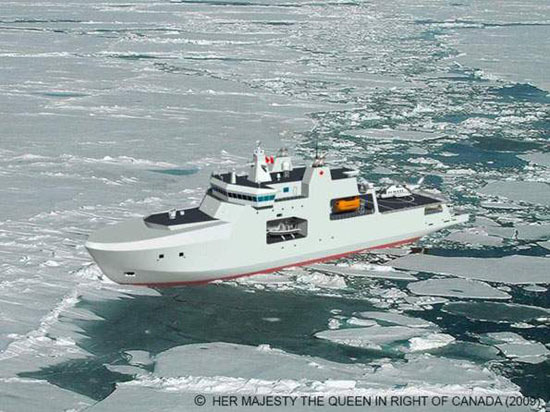 Canada’s Arctic/Offshore Patrol Ships (AOPS) have been in the pipeline for five years. Now, Prime Minister Stephen Harper’s government has signed a CAN $9.3. million contract with the Nova Scotia-based Irving Shipbuilding to begin work on the vessels. It’s an important first step as for a while, even the number of AOPS Canada would acquire was in flux. However, the amount of money represented by the contract is quite small as the ships are estimated to cost CAN $3.1 billion to acquire and a further $4.3 billion to maintain. With the funding from the initial contract, Irving Shipbuilding will review the existing blueprints for the AOPS and begin working on an execution strategy. As part of Canada’s National Shipbuilding Procurement Strategy, Irving Shipbuilding received a $25 billion contract to perform work on 21 large combat vessels. Vancouver Shipyards will construct seven large non-combat vessels under an $8 billion agreement. In Canada’s Arctic region, changing weather patterns are altering the environment, making it more accessible to sea traffic and economic activity. Retreating ice cover has opened the way for increased shipping, tourism and resource exploration, and new transportation routes are being considered, including through the Northwest Passage. While this promises substantial economic benefits for Canada, it has also brought new challenges from other shores. These changes in the Arctic could also spark an increase in illegal activity, with important implications for Canadian sovereignty and security and a potential requirement for additional military support. Canada is a three-ocean country, and it desires a navy that is able to effectively operate in all three bodies of water. As I have discussed before, even though the AOPS technically fall under the heading of “combat vessels,” Vice-Admiral Paul Maddison has stated that the ships will not be “complex combatant[s].” They will not be armed enough to seriously be able to defend themselves in combat. As such, Canada is making a compromise between Arctic patrol vessels and offshore patrol vessels. By possessing elements of both types of ships, AOPS gains the ability to break through ice with its thick hull but loses speed and maneuverability. It might have been better — and more affordable — had Canada ordered some patrol vessels specifically designed for the Arctic and others, which are at a lower cost without the thickened hulls, for offshore, open-water patrol along its Pacific and Atlantic coasts. Canada should not try to have a three-ocean navy all in one ship.